São Bento station concourse tilework. 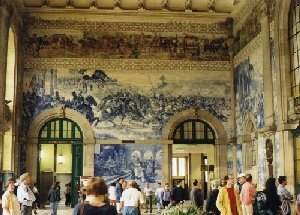 The platforms leading to the tunnel at S. Bento..
São Bento Station is the central station of Oporto and is famous for the tiled murals in its main concourse, as depicted above. The station was opened in 1910 and the hilly and rocky terrain of the city meant that the lines into the platforms lead immediately into a lengthy tunnel. 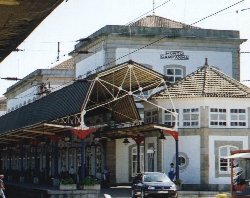 Services are therefore limited and it is Campanhã on the city's outskirts, which is the city's main station. 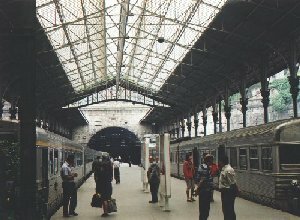 All services from São Bento call at Campanhã but not vice versa. For an account of the journey from here to Coimbra, click here. São Bento occupies a fine stone structure on the eastern side of the Praça de Liberdade, which lies just south of the main Avenida dos Aliados. On the opposite side of the road is the main STCP (Oporto Public Transport) enquiry and sales office. Within the railway station is an efficient enquiry office. As in Lisbon, the main railway station lies some distance from the city centre. Campanhã is 2km from the centre. Access to the station by rail is complicated from the south by the terrain and until recently complicated reversing procedures were necessary. The replacement of the Dona Maria Pia bridge across the Douro by the new S. João structure in the 1990s has simplified this route. Likewise, access to the station from the city centre has been transformed in recent years by the arrival of the Metro, which now serves Campanhã. Trindade Station lies behind the church of the same name which, in turn, lies just behind the Town Hall (Munícipio) at the top of the Avenida dos Aliados. 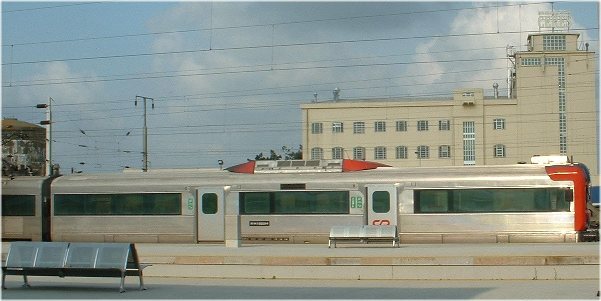 By summer 2001 it had closed and the tracks had been lifted but, before then, it had been a thriving suburban station serving destinations to the north Oporto which included Póvoa de Varzim (30km) and Santo Tirso (25km). 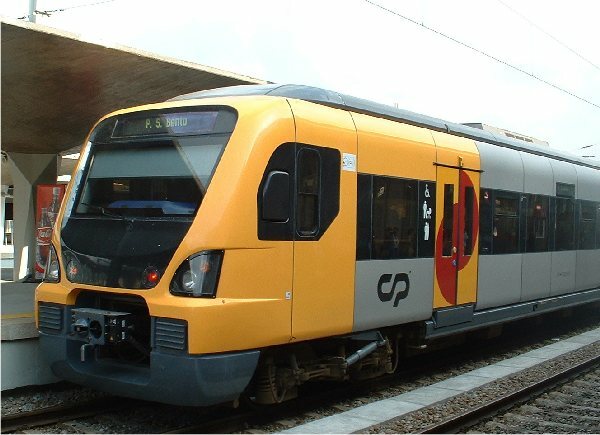 Its narrow gauge services have now been replaced by the new Metro do Porto, a light-rail system and the first new light-rail vehicle ran through to the station on 20 November 2002. By 2005 Trindade was operational as a busy Metro station.. 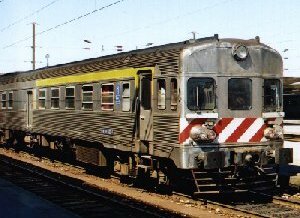 Many of the class 9600 units which formerly operated from here have been sold to Cameroun, with others going to Argentina. 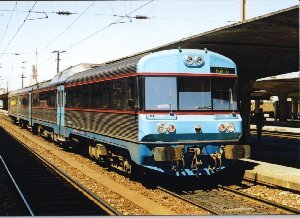 Old and refurbished suburban stock at Campanhã, 2001. Braga (57km) - using green branding and destination header-boards on trains. Guimarães (57km) - using red branding and destination header-boards on trains. Aveiro (44km) - using yellow branding and destination header-boards on trains. Marco de Canaveses (64km) - using blue branding and destination header-boards on trains. New EMUs (class 3400) were introduced in late 2002 on the suburban services. Longer distance services include the Alfa Pendular expresses to Lisbon. These use Fiat Pendolinos and call at Coimbra, Aveiro and Leiria en route to Lisbon Oriente and Santa Apolónia or Pragal. New Eurotram Light-Rail Vehicles (LRVs) are being introduced over a projected 70km network of the Metro do Porto, which will have 66 stations, 10 of them underground. A major feature of this system is a new tunnel linking Campanhã and Trindade stations through which three new services will run via Senhora da Hora, north of the city centre, to Matosinhos, Póvoa de Varzim and Trofa. A fourth line will link Santo Ovídio (Gaia) with Hospital de S. João in Oporto.